So I started to think about how I could make it fit, and I found that it’s not possible with the way Binemust is. It would be better to design a full SIM as an Italian square! I have so many ideas for SIM designs that would look beautiful by themselves, but I cannot afford to buy all the SIMs I would need if I had to keep all of my designs. I want to move away from the multitude of things Binemust is at the moment. I want to keep my designs more simple. 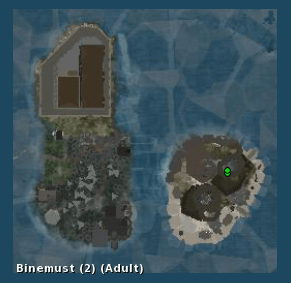 So I plan to close Binemust and Vimmershavn. Take everything down. Make a new design and then open that up to the public for a while – no fixed time just as long as I enjoy it myself and until the creative juices starts running again – then close it, take it down and then build something new. I know I am going to upset some people doing that. There are a lot of members in my group, that love Binemust, but I am hoping for their understanding. * There’re zones were the performance is really daunting. * Keep an eye on the textures (many props uses too many 1k images + normal + spec), and the tris count. * DO not close the sim, (and let us rezz stuff) . Subdivide the sim by 4 sections, and work on each section progressively. Thank you for your feedback Tess. I am aware of the performance and the texturing. It is hard to avoid when you want to press in as much as possible and when you don’t create your own stuff but have to rely on others’ creation to decorate. As for your suggestion about subdividing the SIM – that is what I have done until now, and as I wrote in the blogpost here, I need a change. Sansar is not a good fit for me as I cannot take my SL inventory with me.